Polymers with azo groups as part of their side chains are interesting as starting materials for the synthesis of graft copolymers. 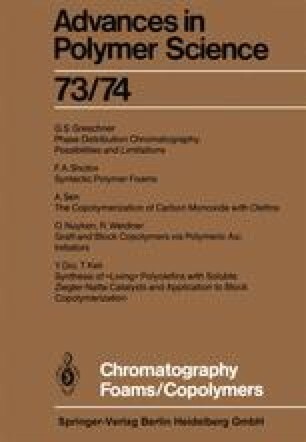 For the preparation of polymeric azo initiators, processes involving the copolymerization of azo-containing and more common monomers are becoming increasingly important. In a subsequent step the products are warmed in the presence of an additional monomer to initiate the graft copolymerization. Especially favourable are systems for which both steps can be carried out in emulsion. By careful choice of reactants this technique, because of its simplicity, can lead to an understanding of some unsolved problems associated with graft copolymerizations. Polymers containing azo groups as part of their backbone chain can be used for the synthesis of block copolymers. The azo-containing prepolymers can, for example, be synthesised by condensing small molecule azo compounds with functionalized polymers, by partial decomposition of polymeric azo compounds in the presence of a monomer or via polymer analogue reactions. Block copolymers are obtained when those prepolymers are decomposed in the presence of another monomer. Disadvantages in terms of the degree of structural control of the products of such radical reactions are compensated by the range of techniques which can be used and the wide choise of possible monomers.